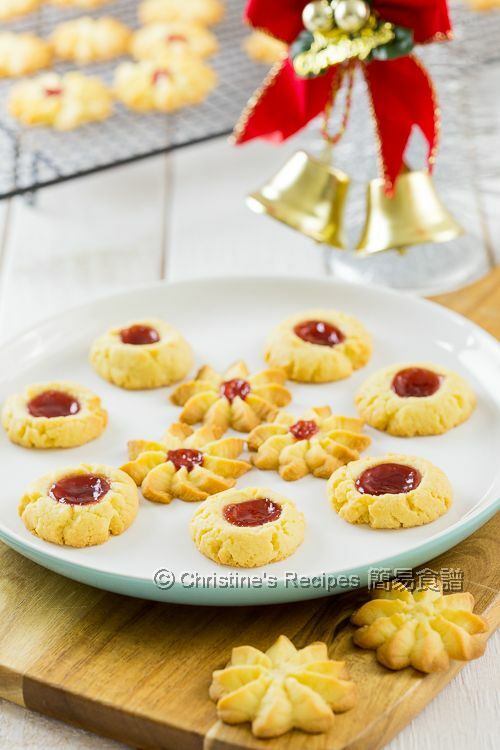 These buttery cookies were dotted and filled with bright red plum jam. 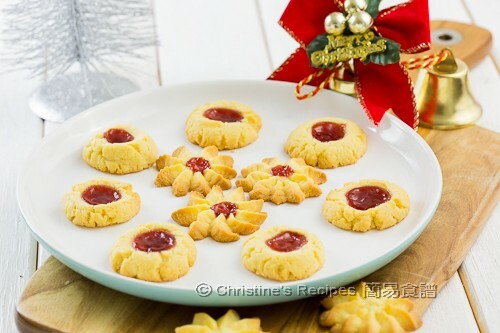 The slightly tangy taste of plum jam is just right to balance the no-so-sweet cookies. I often feel cookies are for festive seasons. Whenever any festive seasons come, especially Christmas, we like to have some and feel the atmosphere. Good things have to be shared. And it’s the meaning of Christmas. So I made two batches to share with friends. If you have kids on school holidays, it’s a good idea to make these cookies with them. It’s fun and good family time. The first step is to make the cookie dough. Beat the butter with sugar until pale and fluffy. This step needs a bit of patience. 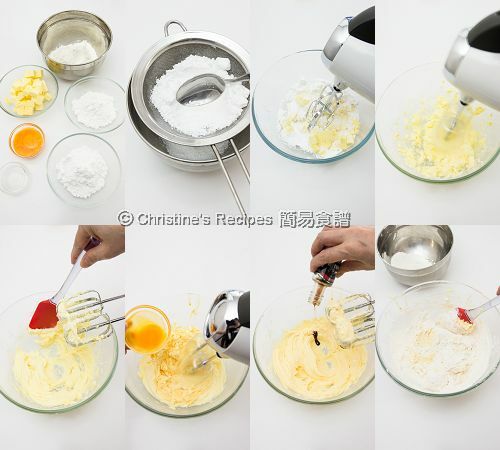 If using an electric mixer, it doesn't take too long though. Add the egg yolks bit by bit. Then a few drops of vanilla extract to increase the aroma. Mix in the cake flour and rice flour. Then you're good to go. Here comes the fun part that your kids will like to play with. Transfer the dough into a piping bag with your favourite nozzle. Or you might like to divide the dough into even portions. Roll each portion into a ball. 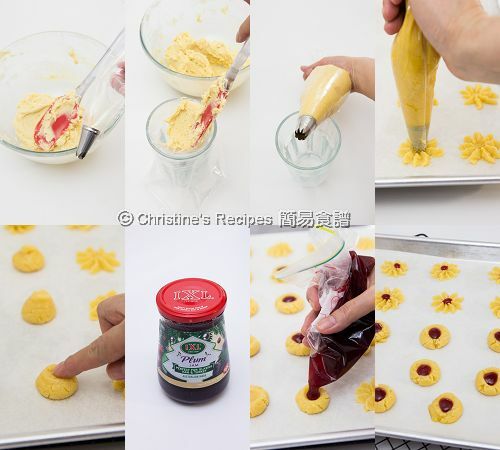 Use your finger tip to make a little hole for jam decoration on top. 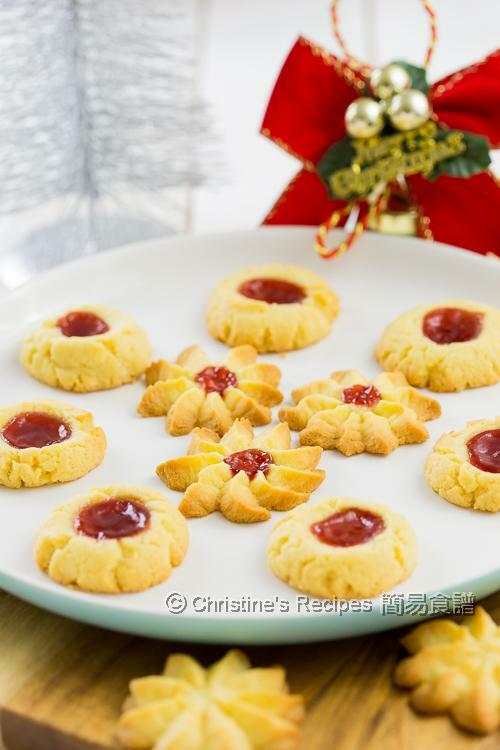 Your beautiful and delicious cookies will be ready after baking for a few minutes. Preheat oven to 180C / 350F. Sift and mix the cake flour and rice flour well. Set aside. Beat the butter and icing sugar until pale and fluffy with an electric mixer. Scrape down the butter from the sides of the bowl with a spatula if necessary. Beat in the egg yolks bit by bit. Don’t add in one go because you don’t want the butter mixture splits. Add salt and vanilla extract. Fold in the flour mixture in 3 batches with a spatula. Combine well. Transfer the batter into a piping bag. Pipe batter with your favourite pattern onto a lined baking tray. Or you might like to roll the batter into small balls, about 2.5 cm / 1 inch in size. Lightly press with your finger tip to make a well in the middle. Mix the jam with warm water well. Put into a plastic bag. Cut away a small tip at a corner. Drop a little bit in the middle. Or fill the hole of the small dough. Bake in the preheated oven for about 10 to 12 minutes. For the small balls, bake further 5 minutes or so, until golden brown on the bottom. Remove from the oven. Let cool on a wire rack completely. Enjoy! You can use any jam you like. The consistency of each brand might be different. The amount of water can be adjusted accordingly or don’t need any water at all. I used pure icing sugar without any starch mixed inside. The leftovers can be kept in an air-tight container for a few days. Cake flour is a kind of low protein flour. Rice flour doesn’t contain any protein at all. Both are available at supermarkets and Asian grocers. They look really super, Christine. I too feel the same about cookies and holidays. Can I substitute icing sugar for something else? You may use caster sugar instead. The texture of the end product will be slightly different. You can use cake flour instead. Can we just use regular all purpose flour instead? Yes, you can use all purpose flour instead. It's fine. You may expect a slight texture change of your end products.